I love entertaining. I love being a hostess. I love planning a party. I love coming up with new recipes for my party. I love setting up the table and making everything look pretty. The plating, the place setting, the décor, the food, the drinks – I think I live for that sometimes! One thing I have been wanting to cover here for a really long time, but haven’t gotten around to it, is entertaining a crowd, ideas to set up the table and drinks to go with the food. That sort of thing. I do this quite a lot, but still not enough, as life happens sometimes and you just don’t get around to it. But the times I do entertain a big crowd of our friends, I try to do something a little different each time. We are fortunate to have a big enough space, with a breakfast nook, a dining table and a big kitchen island, all of which I take turns to making it the center point of the party. It is good to mix and match depending on the crowd and where you think you will want the party to be centered around. If you do not have the luxury of so many staging areas, you can always use a portable table and set it up in a different area than your dining area and make it pretty with a table cloth on top of it, some flowers etc. You can always take your party outdoors too, if weather permits. But that’s a different topic altogether. One of the best things you can do to yourself as a host is to try an make ahead part of the menu as much as possible, so you are not cooking all day long and are tired and ready to plonk down on the sofa, when your guests arrive. 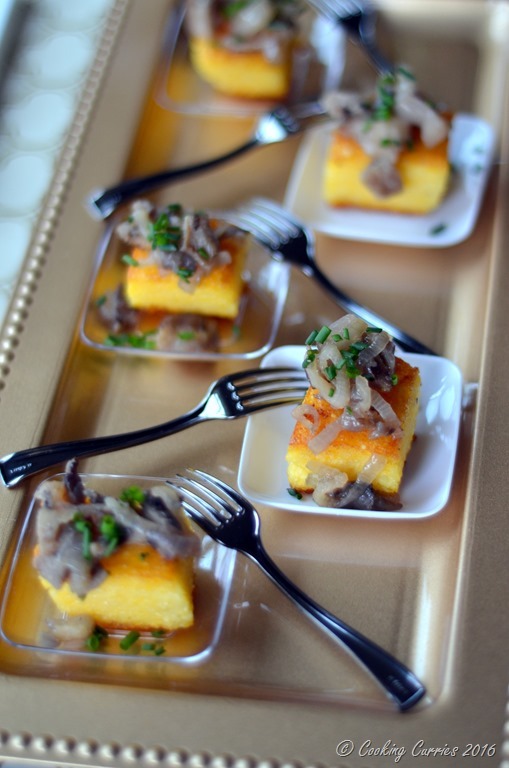 This Truffle Polenta Crostini with Wild Mushroom Sauté is perfect for that, as you can make the polenta cakes ahead and refrigerate them. You just need to cut them into squares and fry them on the day of the party and just make the topping and put it on it when the guests are there. Have a cheese plate to go with it with some crackers, assortment of cheeses, fruit pate, olives, grapes etc. And keep the drinks coming. I usually have a couple of reds and a couple of white wines ready and also toss some bottles of beer in the fridge. If anyone feels up to a cocktail, we usually just make a simple margarita or a mojito. Keep those lime and lemon and mint leaves handy! With that and any juice you have, you can pretty much swing a cocktail most of the time. As for the mains, I have a pasta bake or a lasagna and/ or a chicken bake (depending on how many meat eaters and vegetarians I have in the crowd) and maybe a couscous salad on the side, that way even if someone does not like the pasta, the couscous salad has some carbs in it to keep everyone full! To make the polenta: Bring the 4 cups of water to a boil with the butter and salt in it. Add the corn meal, little by little and stir into the water keeping the heat to medium. Keep stirring for about 10-15 mins or so, till the polenta starts leaving the sides and thickens. Add the truffle oil and mix it in. Grease a square baking pan and pour the polenta into it. Spread evenly, cover with a cling wrap and refrigerate. Heat some olive oil and add the shallots and mushrooms to it. Add salt, pepper and garlic powder and sauté till soft. Just before its time to serve, take out the polenta and cut up into squares and shallow fry till golden on both sides. Drain on paper towels and top with some mushroom mix and a little bit of the minced chives as garnish. Serve immediately. Disclaimer: This post contains links from Amazon Affiliate program which provides me a commission, if you click from here and buy the product. These look so sweet, they sound so tasty too! These look so indulgent and delicious. Perfect party food too! 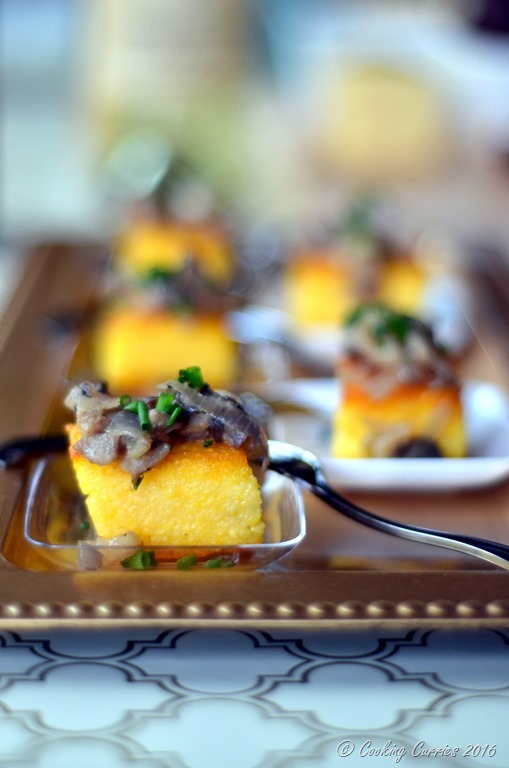 These look great and I love that you can make the polenta ahead of time! These are so elegant! I want to come to one of your parties! I’ll bring the wine! Sure!!! You are so very welcome! (As long as you bring the wine! ?) ? Thanks Krish! Like I’ve said before I consider myself a global-desi when it comes to food ? Thanks Eileen!!! 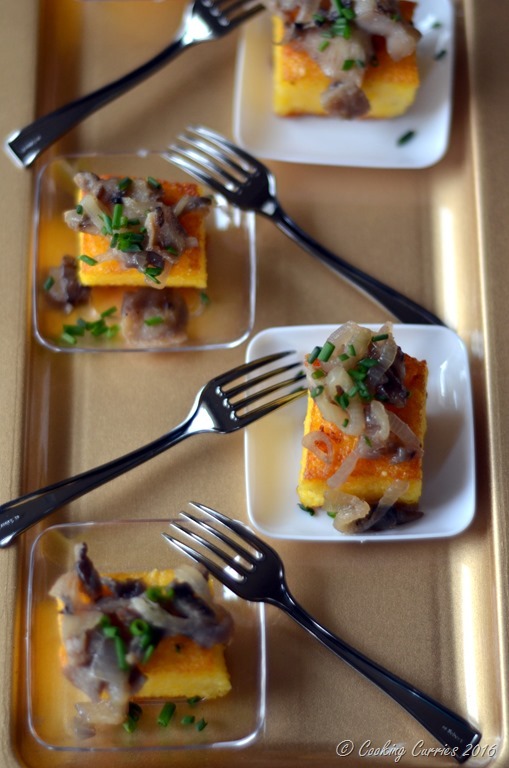 Polenta is a great base to try and experiment with different flavors. I love it! Wow. These truffle polenta crostini look so fancy. I’ve never tried making polenta before but this recipe might be what finally makes me take the plunge. ?? glad to have sparked that in you! And thanks! These are perfect party food and they look very moreish! Thanks for sharing. Absolutely gorgeous! I am beyond impressed at your plating and the recipe is divine!! Aww! Thank you Heather! ? OK…I would devour these! 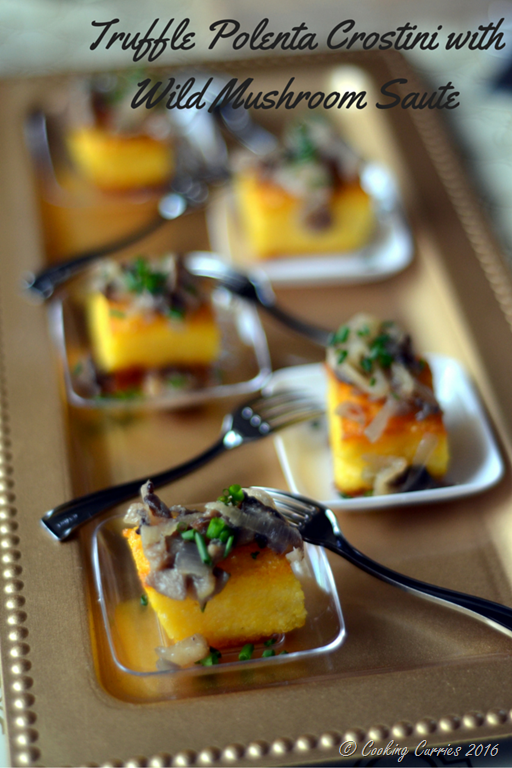 Truffles, polenta, and mushrooms!? Too much goodness for one crostini! Pinned!